Playgroups are a good opportunity to get out of the house and meet other mums. There are playgroups on throughout the week Wandsworth. Here is our pick of the best. Come and join us to make friends and share experiences with other mums-to-be, new mums and babies and those with toddlers. Tea, biscuits, toys and friendly chat and support provided. This group has been made possible with thanks to premier sponsor Nightingales Doctors, and other sponsors Body-A-Wake; WaterLife swim school; and Independent mindbodysoul. They have activities every day and lots of toys. Daily "stay and play" sessions for children aged 5 and under with their parent or carer. Various activities eg painting, sand and water play and outdoor activities. Links with local health team. They have activities every day and lots of toys and are free to all. Great activities and resources for children�Including: playdough, water, sand, climbing, play kitchen, farm animals, dinosaurs, books, messy play, painting, sticklebricks, instruments, dressing up and much more.�Play inside and in a safe enclosed outside area too.�Lovely area for babies with treasure baskets promoting heuristic play. Plenty of objects to stimulate the senses, mirrors etc.Thursday mornings from 10am to 11.30am.�It is run by Wandsworth Council, and is FREE! We work out of Rudolf Steiner’s philosophy of the developing child. Come and join us for creative play and crafts, followed by a wholesome snack, a ringtime and a short story or puppet show related to the rhythms, seasons and festivals of the year.�Currently, we offer Parent and Child groups for children under the age of three on some mornings and afternoons. Please contact the school on 020 8870 0500 for more details. Age range from 0 months to 3 years. Older siblings welcome during school holidays (up to age of 5years old). First session is free to enable you to check what we are up to in our session. Come along to our wonderful under 2s group ever Friday morning. We provide a range of interesting activities, to encourage your little one to explore and learn through play by following the EYFS. �Staff are available to offer support and information to parent. Our families really enjoy our singing and action songs at 11 am. Free entry Under 2s only. Drop in and register. Drop in toddler group with toys, fun and games for under 3s.�Fridays: Runs as two sessions: 9.15 to 10.45 and 11am to 12.30. Toddler group for children from 1 to 4 years.Toys, books, dressing up, songs and rhymes and different craft activities each week, such as painting, icing cookies etc...This group operates a strict waiting list system and is heavily oversubscribed. Contact them to add your name to the list. Drop in centre for children under 5 and their parents/carers. No charge. Open from 1pm to 3.30pm on weekdays. Toddler group for children from 0 to 3 years. 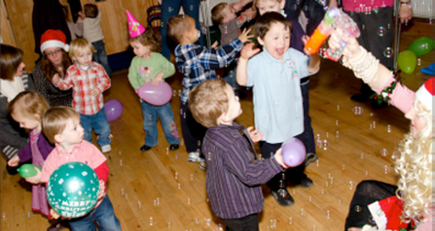 Activities include: art & craft, toys, books, songs and rhymes, dressing up and rough and tumble. Drop in centre for under 5s and their parents or carers. No charge. Open from 1pm to 4pm (1.30-4.30 in summer) every weekday. Sing alongs at 3pm every Mon, Weds and Fri.